Racking horse stallion "Undertaker’s Aftershock." Photo courtesy of Misty Mountain Farm (all rights reserved; used by permission). Racking horse stallion; Photo by [file:field-file-photographer]/[file:field-file-source] ([file:field-file-license]). Many other states have adopted horses as official state symbols: Morgan horse (Vermont and Massachusetts); Appaloosa (Idaho); thoroughbred (Kentucky and Maryland); Tennessee walking horse (Tennessee); Nokota horse (North Dakota); Missouri fox trotting horse (Missouri): Colonial Spanish mustang (North Carolina); Florida cracker horse (Florida); "the horse" (New Jersey); and the marsh tacky (South Carolina). Horse symbols have been proposed for Oregon (Kiger mustang), and Arizona (Colonial Spanish horse), but have not yet been adopted. The origins of the racking horse date back to the Colonial Era in America, where the horse was popular in the South because it was versatile, could be ridden comfortably for hours, and had a calm, friendly disposition. . 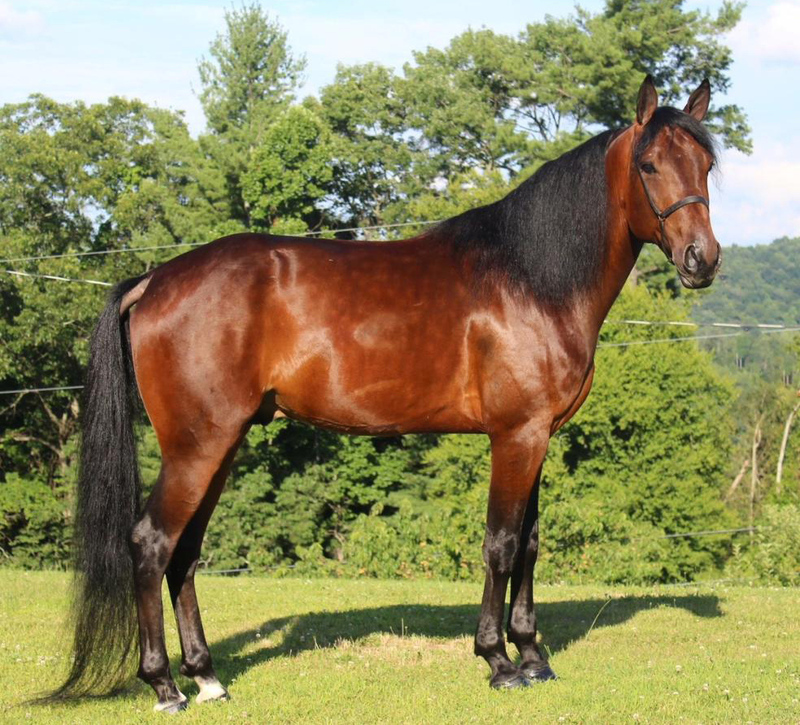 Similar to the Tennessee walking horse , the racking horse has a smooth, natural gait and is very strong (able to sustain a rapid pace for long periods). The Racking Horse Breeder's Association explains: "The “rack” of the Racking Horse is a bi-lateral four-beat gait which is neither a pace nor a trot. It is often called a “single-foot” because only one foot strikes the ground at a time. The Racking Horse comes by this gait as naturally as walking or striking a bold trot comes to other breeds. He is not to be confused with other breeds, with which the “rack” is an artificially achieved gait resulting from special training." The racking horse averages 15.2 hands (a little over 60 inches) high and about 1,000 pounds. They can be many colors from black, chestnut, brown, gray, yellow, spotted, palomino and more. The racking horse is famous for an extremely comfortable ride and unusual friendliness to humans. A group of Alabama businessmen formed a corporation and initiated the legal processes that were necessary to designate this horse as a distinct breed. In 1971 the USDA recognized the Racking Horse Breeders' Association of America, thereby allowing a registry to be established to perpetuate the racking horse breed.